We have separated our infrastructural facility into several units and one of them in warehouse. In order to maintain high quality standards, we laced our facility with modern technology. Interested buyers can contact us anytime for placing orders; we ensure timely delivery of the same. 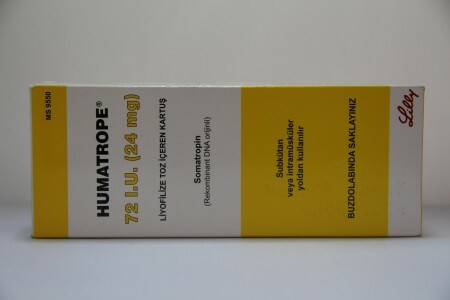 Pediatric Patients - Humatropin is indicated for the long-term treatment of pediatric patients who have growth failure due to an inadequate secretion of normal endogenous growth hormone. Childhood Onset: Patients who were growth hormone-deficient during childhood who have growth hormone deficiency confirmed as an adult before replacement therapy with Humatropin is started. Biochemical diagnosis of growth hormone deficiency, by means of a negative response to a standard growth hormone stimulation test [maximum peak < 5 ng/mL when measured by RIA (polyclonal antibody) or < 2.5 ng/mL when measured by IRMA (monoclonal antibody)]. WARNING : If sensitivity to the diluent should occur the vials may be reconstituted with Bacteriostatic Water for Injection, USP or, Sterile Water for Injection, USP. 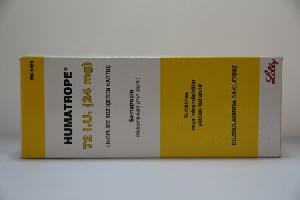 When Humatropin is used with Bacteriostatic Water (Benzyl Alcohol preserved), the solution should be kept refrigerated at 2° to 8°C (36° to 46°F) and used within 14 days. Benzyl alcohol as a preservative in Bacteriostatic Water for Injection, USP has been associated with toxicity in newborns. 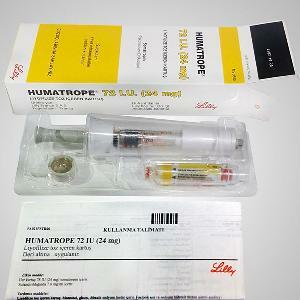 When administering Humatropin to newborns, use the Humatropin diluent provided or if the patient is sensitive to the diluent, use Sterile Water for Injection, USP. 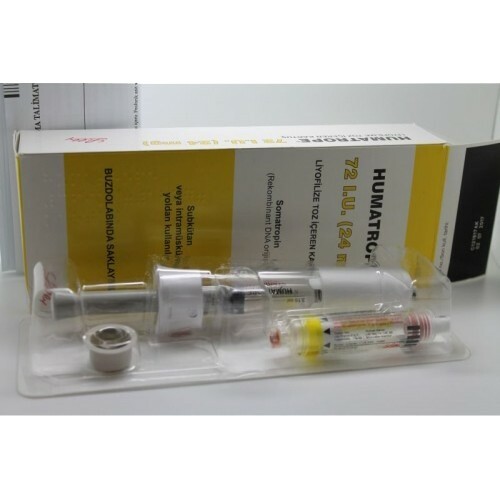 When Humatropin is reconstituted with Sterile Water for Injection, USP in this manner, use only one dose per Humatropin vial and discard the unused portion. If the solution is not used immediately, it must be refrigerated (2° to 8°C [36° to 46°F]) and used within 24 hours. ADVERSE REACTIONS: Growth-Hormone Deficient Pediatric Patients- - As with all protein pharmaceuticals, a small percentage of patients may develop antibodies to the protein. During the first six months of Humatropin therapy in 314 naive patients, only 1.6% developed specific antibodies to Humatropin (binding capacity >/= 0.02 mg/L). None had antibody concentrations which exceeded 2 mg/L. Throughout 8 years of this same study, 2 patients (0.6%) had binding capacity >2 mg/L. Neither patient demonstrated a decrease in growth velocity at or near the time of increased antibody production. It has been reported that growth attenuation from pituitary-derived growth hormone may occur when antibody concentrations are >1.5 mg/L.